Holly Girouard is a driven, self taught full stack developer with a passion for React. Holly primarily functions as the full stack senior developer, and CEO for her company, Hoops by Holly. In addition to Hoops by Holly, Holly is also a Distinguished Faculty Member, Lead React.js Instructor for both the Denver Campus and the Remote Campus, and Curriculum Developer for General Assembly. Holly’s company, Hoops by Holly started out as a hula hoop company after she realized the demand in her area for hula hoops. After taking a deep dive into the tech industry and finding her passion, Holly rebranded Hoops by Holly as a development company that “Helps your organization jump through technical hoops”. One of the most noteworthy projects for Holly and her team is Doing Things Media which has a social media following of over 40 million viewers. 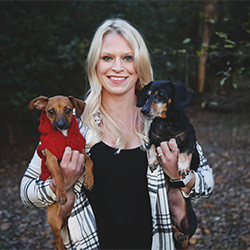 In her spare time, Holly enjoys outdoor climbing, creating hobby coding projects with her husband and fellow GA instructor, Zeb, and taking their two dogs, Zeus and Spunky on big adventures. A walkthrough to help you convert React component lifecycles into Hooks using the useEffect Hook. A walk through showing you how to easily convert a class-based component to a functional component using the useState hook in React. How dividing components into smart and dumb (container and presentational) components provides organization, saves time and improves your React apps. Here's a quick guide on how to use flexbox styling in your React Native apps to create interesting layouts. Getting started with a linter using Create React App, and how to configure it to meet your project needs. Building snazzy forms in React using SVG icons from Font Awesome 5. This is part 2 of a series on building forms using Reactstrap. Highlighting the benefits of using Reactstrap, a library of components based on Bootstrap 4, for forms in React apps.